The sterile language of a detached president illustrates how far we are from facing the reality of our own government’s deliberate atrocities. Hiroshima was certainly destroyed, abstractly, with “a terrible force unleashed” – but by no one? In the president’s passive parsing, it’s as if he thought it was an “act of God.” More honestly told: President Truman approved the atomic bombing of Japan, which was carried out on August 6, 1945, by a Boeing B-29 named Enola Gay, after the pilot’s mother, that dropped a uranium-235 fission bomb cutely nicknamed “Little Boy” on a largely civilian city, killing an estimated 140,000 people(thousands of whom were vaporized without a discoverable trace, while thousands more died from radiation effects over ensuing years, a death toll made worse by US denial of radiation danger and strict censorship of any public discussion during the occupation). Hiroshima was one of the greatest military massacres in history, eclipsing American massacres of Native Americans by several orders of magnitude. Picturing Obama preaching from a bar stool might seem harsh. But the United Nations’ Open-Ended Working Group on multilateral nuclear disarmament, with more than 100 countries, has been working for two years – without US participation. Also without participation by China, France, Russia and the UK – and they don’t even preach from barstools. Nor do many of them visit Hiroshima. 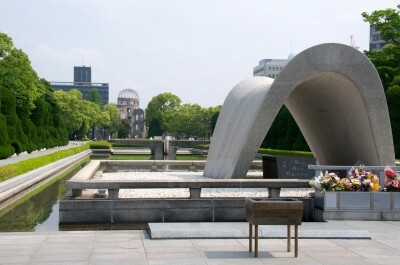 The vision of the Hiroshima Peace Memorial is the complete international abolition of all nuclear weapons and thepromotion of world peace. It’s where officials go to engage in lip services. If Obama had wanted to be genuinely historic, he could have visited Nagasaki. There was no excuse for Nagasaki; it was a pure war crime. Unlike Hiroshima, there’s no credible military argument that Nagasaki had to be destroyed to get Japan to surrender. Hiroshima on August 6 was probably enough. TheSoviet invasion of Manchuria and declaration of war on Japan on August 8 was surely enough. The class was done, all the grown-ups had to do was collect the papers and start grading them. Japan’s Emperor Hirohito publicly accepted the terms of unconditional surrender on August 15. The Soviets, who had been begged by the Allies for months to enter the war, continued fighting till the official surrender on September 2.